Thank you for writing in with this great topic. You are not alone with these issues, as I have had many clients come to me with similar concerns and I am happy to say you are definitely NOT doomed. Menopause is a time of major transition in a woman’s life. Many changes are happening, both physically and psychologically and it can be a very difficult time for many women. As you are currently experiencing, the menopausal transition can be tri-doshically disruptive with symptoms of Vata, Pitta and Kapha imbalances manifesting. The weight issue specifically is the result of a Kapha imbalance, and even more specific, a Kapha digestive imbalance know as Manda Agni or slow-low digestive fire. As the estrogen levels begin to drop just before and during menopause, the metabolism also is shifted, slowing down rather dramatically. Unless precaution is taken, the result is weight gain and typically around the midsection. This explains why your diet and activity level may remain the same, yet your weight steadily begins to climb. Although this issue is all to common among women in their 40’s and 50’s, it is not to say you are doomed. With the help of Ayurveda you can indeed increase the digestion-metabolism; preventing any further weight gain and reducing the pounds that have already accumulated. The best advice I can give to you on this matter, is to make some permanent shifts in your diet and eating habits. This doesn’t mean extreme dieting or starving yourself, but rather making shifts in the types of food you eat, and even more importantly, how you are eating. Since a slow metabolism is typically thought of as a Kapha imbalance, it will be important to follow a Kapha diet routine. Here is a list of some dietary tips that will help to increase the digestive fire, boost the metabolism, and in time reduce the accumulated weight gain. 1. Reduce the overall intake of food. Menopausal hormone shifts lead to a reduced metabolism, dropping as much as 20% in rate. The volume of food intake therefore needs to reflect this drop in order to counterbalance this change. Therefore the overall food intake should begin to reduce about 20% by eating with awareness, controlling meal portions and eliminating overeating. 2. Eat your largest meal mid-day. This Ayurvedic “food rule” is vital, especially when dealing with a Kapha digestive imbalance, slow metabolism and weight gain. The Agni or digestive fire is highest between 12-1pm, and therefore the largest most nourishing meal should be taken at this time. If meat, dairy or other heavy foods are to be eaten, this is the meal they should be consumed in, while avoided otherwise. 3. Eat on a consistent, healthy weight-loss (aka Kapha-reducing) meal schedule. 4. Avoid snacking and grazing. Due to the reduction in metabolism, food takes much longer to digest. Therefore snacking between meals overtaxes the digestive fire even further, leading to toxic build-up and further weight gain. 5. Take a 15 minute walk after each meal. This simple ritual is a great way to increase the digestion post-meal. Moving around after food is very beneficial for increasing the metabolism and aiding in the digestive process. Alternatively, laying down after food should always be avoided. 6. Avoid all food after 6pm. This is another essential “food rule” when dealing with a low digestive fire. The metabolism which has already begun to slow down during menopause, is at its slowest point in the evening and into the night. Therefore, any food taken in after 6pm (on average) increases the risk of indigestion, toxic formation and weight gain. Alternatively, taking a light dinner before 6pm each night will aid in increasing the digestion-metabolism and help to boost weight loss. 7. Reduce overall stress levels. 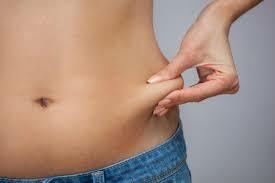 High stress levels produce increased cortisol levels which is a major cause of the mid-section weight gain. It is also a common instigator for a depleted digestive fire and toxic accumulation. Make sure to control stress levels through nourishing self-care practices such as Yoga, meditation, Abhyanga (self-oil massage), warm baths, being in nature, outdoor walking, exercising, relaxing and avoiding over-working. 8. Make sure to get enough sleep each night. Sleep is another area that tends to shift during the time of menopause. Unfortunately sleep also plays a key role in the homeostasis of our stress levels, appetite regulation and metabolism. If you are also experiencing sleep issues due to the menopausal transition, this will be another key area to focus on for sufficient weight loss. 9. Use herbs to help balance hormones and increase the digestion and metabolism. Herbs can be a great compliment to any menopausal therapy. They are very useful in balancing hormonal fluctuations, increasing the digestion-metabolism and enhancing weight loss. 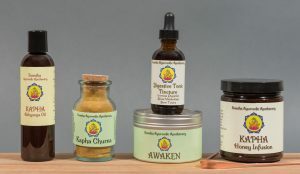 Some great options may be Moon Goddess Tincture, Women’s Balance Blend Tea, Kapha Honey Infusion, Healthy Digestion Tea, Detox Tea, Triphala Churna or digestive spice mixtures such as Agni Churna and my Ayurvedic Breakfast Spices. So Doomed in Menopause, by following these powerful shifts in the diet and lifestyle you will make dramatic improvements in speeding up the metabolism and aiding in weight loss. The weight may come off slow, but with consistency, compassion and self-discipline; this will definitely be steady and long-lasting. I encourage you to begin to make some of these changes beginning today, working at obtaining each one of these goals in time. Do not expect to make all of these changes overnight, but instead get used to a few goals each month and then add on steadily. Thank you again for sharing a part of your story. I know many other women are experiencing the same issues as you, so please know that you are not alone. By making these changes in your daily routine, you will not only notice a positive shift in your weight, but also an increased amount of energy, self-confidence and overall sense of well being. Following these recommendations will help to balance out the hormonal shifts, easing you in your transition and benefiting all of the other negative menopausal symptoms (hot flashes, hair loss, etc) you are experiencing as well. Please keep me posted on how it goes and contact me anytime questions or concerns arise. I fully support you during this time, and wish you the strength and courage to make the needed changes in your life. I read the article it is very clear and specific. I want to ask that what if one has the same weight gain symptoms but are because of hormonal imbalance or shrinking period cycle. Can this be the cause is it possible to have weight gain because of decrease in days of periods or quantity. Is there any link between. Age is 29. Thank you for writing! Hormones regulate pretty much everything in our systems including our metabolism. So if there is irregularities in the cycle (possibly indicating hormonal imbalance) this can potentially cause changes in the metabolism. Typically it is the decrease of estrogen that will cause this however, so you would have to get your hormone levels tested in order to find out if there is a potential link in your case.